Some time back, I posted a pair of commentaries entitled “Streets, Roads and All That,” covering a number of aspects of modeling streets and roads. This included signage. 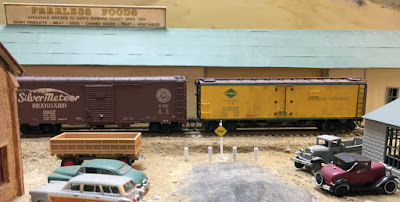 I began with an overview of street-related topics (see that post at: http://modelingthesp.blogspot.com/2013/03/streets-roads-and-all-that.html ), and then went into more detail on the specific subject of railroad grade crossings and the various required signage for them (see this post at: http://modelingthesp.blogspot.com/2013/03/streets-roads-and-all-that-part-2.html ). In the present post, my subject is warning signs (a topic introduced in the first of the two posts cited in the paragraph above), and in particular how road ends are identified in signs. I mentioned in a recent post that I have on my layout some road endings that are unmarked and without barriers, and that I wanted to correct this. (That post, including an appropriate photo, is at this link: http://modelingthesp.blogspot.com/2018/07/management-by-walking-around.html .) The first requirement for correcting these omissions is, obviously, signage, so I researched the topic on the internet. 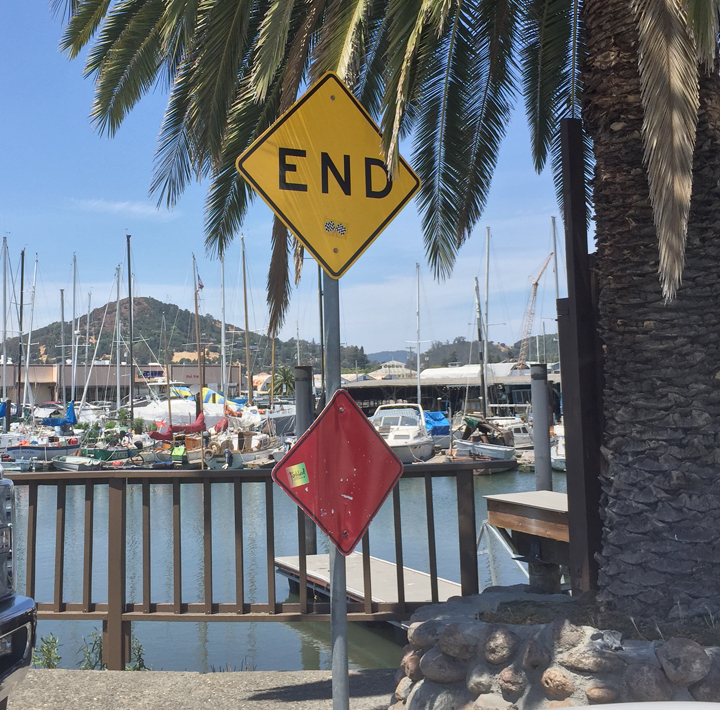 There are a great many variations on “end of road” signs, including such warnings as “Not A Through Street” and “No Outlet,” but I wanted something to mark the actual street end, not a warning to motorists entering such a street. Here again, there are a bunch of available legends (the choice here can be up to state highway authorities or in some cases to local jurisdictions as well). Below are a few of the ones I considered using. Signs like these, of course, are in common use today. One of them that is familiar to me is at the Pier 15 bar and restaurant in San Rafael, California, where a group of friends meets monthly for lunch. 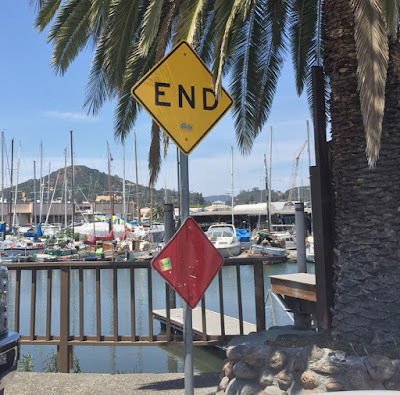 Anyone who managed to pass the “End” sign would hit the water! Images of signs like the ones shown above, and many, many more, are readily available on the internet, and can be downloaded, then converted down to HO size while increasing resolution so they will print all right. The usual size of yellow warning signs is 24 inches on a side, though larger sizes are used if needed in a particular situation. They are normally placed at least seven feet above the ground. 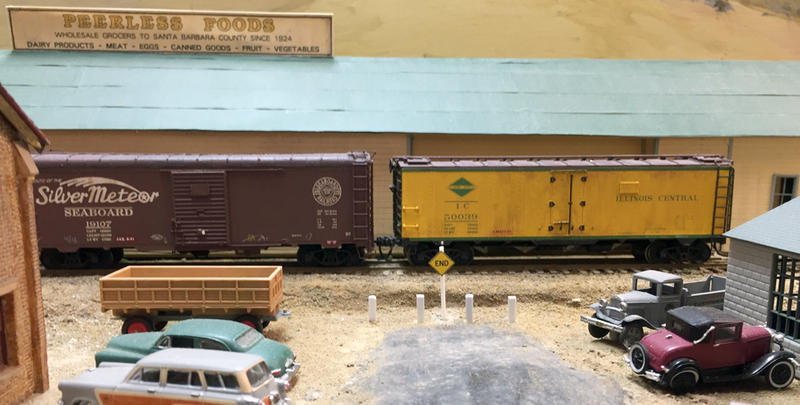 For the end of Corralitos Lane in my layout town of Santa Rosalia, a street passing between a Richfield bulk oil dealer (at left in the photo below) and the shipping warehouse of the Coastal Citrus Association, I made a barrier with a horizontal board, and attached the “Road Ends” sign to the barrier. Beyond the barrier are the tracks of the SP branch into Santa Rosalia. 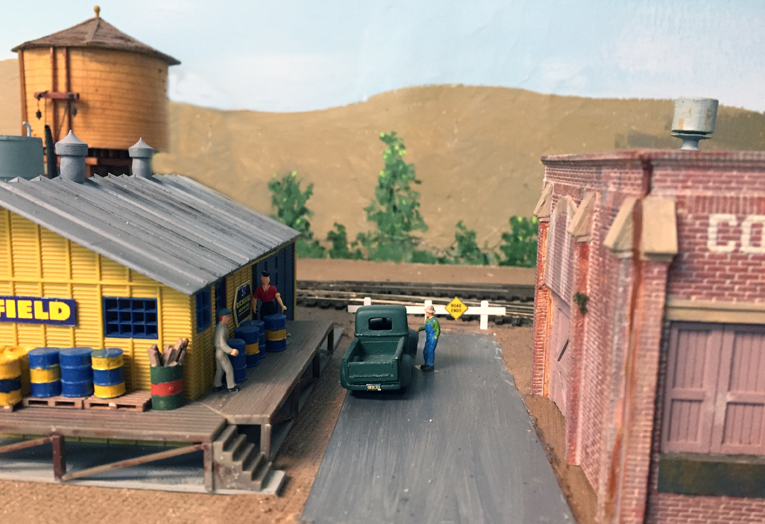 Adding these signs and barriers fulfills one of the visual shortcomings I recognized on my layout, and I’m happy to have corrected the problem. And it was also interesting to have learned more about road signs and sign history!